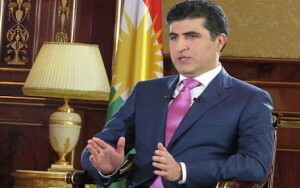 Nechirvan Barzani was appointed Prime Minister of the Kurdistan Regional Government’s eighth Cabinet in June 2014. Mr. Barzani led the fifth Cabinet from 2006 – 2009 and the seventh Cabinet from 2012 – 2014, spearheading a number of strategic developments in the Kurdistan Region. Prime Minister Barzani was born in 1966 in the mountain village of Barzan. He is the grandson of Mustafa Barzani, the legendary Kurdish leader and founder of the Kurdistan Democratic Party (KDP). His father, Idris Barzani, was a senior leader of the KDP and spent his life fighting for the rights of the Kurdish people. In 1975 Mr. Barzani and his family, along with tens of thousands of Kurds from Iraq, fled to Iran in search of safety from Iraq’s Ba’ath regime. Following in the footsteps of his father and grandfather, Mr. Barzani became actively engaged in Kurdish political affairs and rose rapidly through the ranks of the KDP. He was first elected to KDP leadership at its tenth Congress in 1989 and re-elected at subsequent congresses. In 1996 Mr. Barzani was appointed Deputy Prime Minister of the Kurdistan Regional Government, which was established following the 1992 elections in the Region. In 1999 he was appointed Prime Minister. In March 2006, he was chosen to lead the fifth Cabinet, the KRG’s first unified cabinet. Prime Minister Barzani also holds the position of KDP Vice President. In his capacity as Prime Minister, Mr. Barzani has promoted a number of strategic initiatives designed to improve the standard of living and social and economic climate in Kurdistan. These include an ambitious natural resources policy, promotion of economic and political relations with neighbors and the international community, formation of a robust domestic economy, promotion of foreign investment, defense of the rights of women, promotion of basic and higher education, and the complete reconstruction of the Kurdistan Region’s infrastructure – particularly the electricity grid, water resource management, housing, and road networks. Mr. Barzani is widely considered as a key architect in the success of the Kurdistan Region. His vision continues to drive the government’s social, political, and economic policy aimed at improving lives of citizens in the Region, as well as relations with Turkey and the KRG oil and gas policy.